PAX is coming up and I need to get crackin' on my cosplay projects if I want to have a different outfit to wear each day! Alas, the amount of work I need to accomplish my goals is somewhat unrealistic. This calls for some project planning. Status: Costume complete. In process of making a [Staff of Infinite Mysteries] (prop). Status: Costume complete, mistcloak needs minor repair. 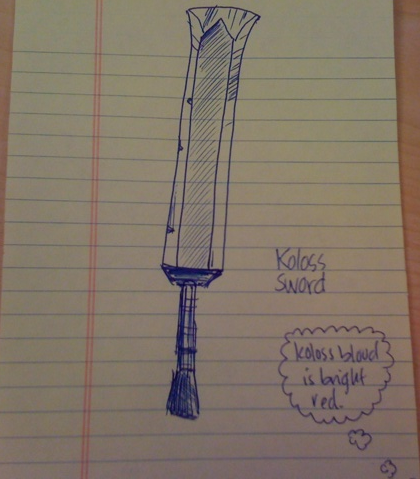 I want to make a Giant Koloss Sword (prop). Step 1: Sort out your priorities. As it stands, I have two wearable costumes, but both costumes are lacking without the props. My first goal should be to finish the [Staff of Infinite Mysteries], which I have already started working on. However, my next goal needs to be the Miss Fortune costume because there is going to be a League of Legends costume contest and I want free LoL stuff! 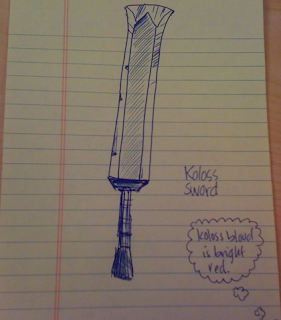 Once I finish my staff I need to start working on that costume right away. If I have two nights left and it looks like I can't finish Miss Fortune on time, I will work on the sword and get that done, but I would rather have a completed Miss Fortune costume so I don't want to spend two nights working on a sword I don't really need. 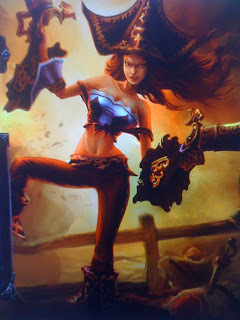 Miss Fortune, on the other hand, needs two guns, and I know those props are going to be more difficult to create than the giant Koloss sword; the sword is bigger but quite simple to make. Step 2: Plan your time. 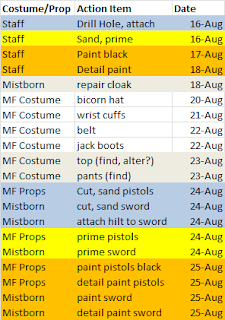 First, made a list with three columns: A)Costume/Prop, B)Action Item, C)Date and filled in the details for each step I need to complete. Then I color-coded by action type (minor/easy=grey, workshop=blue, primer=yellow, painting=orange, sewing=white). It will be more productive to do similar projects at the same time. I left off Aug 19 because I will be busy that day, but I assigned all of the other tasks to different days. However, looking at my list, I don't think there is any way I can get all of this done! I should have more time to work on the 18th, but there is too much crammed into the 24th and 25th. 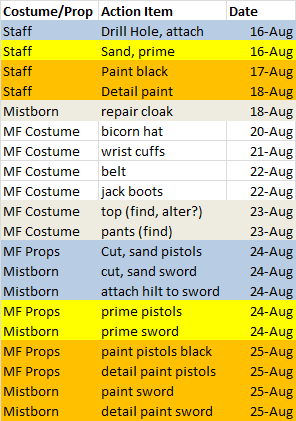 However, if I am running behind I can eliminate the Mistborn items on the 24th and 25th because of my priorities. Step 3: Get workin' and stick to schedule! How much do you think I can accomplish? We'll just have to find out after PAX!